When Joe Tex took “Hold What You Got” to the #1 spot on the charts in 1964 not surprisingly it sparked a whole lot of discs with a similar approach. 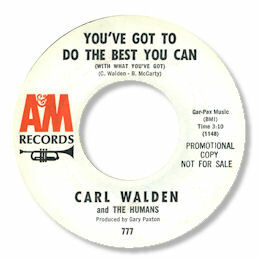 One of the best was this killer ballad from Carl Walden. It’s easier to list the ways that You've Got To Do The Best You Can aped Tex’s song than the differences – structure, “cheesy” organ, well arranged horns, mini raps, arpeggio guitar etc etc. But despite all this I’ve got a big soft spot for this one, not least because of the double tracked vocal, but mostly for the way Walden screams and yells through the end part. Lovely! The old adage about imitation and flattery was never truer. The Sims Twins also did a super version of this number on Omen. UPDATE ~ Davie Gordon has written with further info about Carl Walden - "He's a white guitarist / pedal steel player who mainly worked with rockabilly acts in the fifties then moved on to working as a session guitarist for more mainstream country acts in the sixties." Davie has added the Almo Int 45 to the discography as well. Greg Burgess has added the Shazam 45. I'm grateful to both Davie and Greg for their knowledge and enthusiasm.